The Law Council of Australia's Justice Project is a comprehensive, national review into the state of access to justice in Australia which focuses on justice barriers facing those with significant social and economic disadvantage, as well as identifying what is working to reduce those barriers. In engaging with the Law Council of Australia’s Justice Project, Community Legal Centres NSW focused both on economic disadvantage as a significant entrenched structural issue that prevents equal access to the justice system, and how different categories of vulnerable persons experience barriers to justice. Case studies of such vulnerable persons have been included to show the real stories which highlight the difficulties such groups face within the justice system. rural, regional, and remote Australians. In focusing on the experiences of these vulnerable groups, Community Legal Centres NSW has drawn on the work of its member organisations, and how this work highlights the importance for the Law Council of Australia to include both community legal centres and Aboriginal legal services in its Legal Aid Matters campaign. 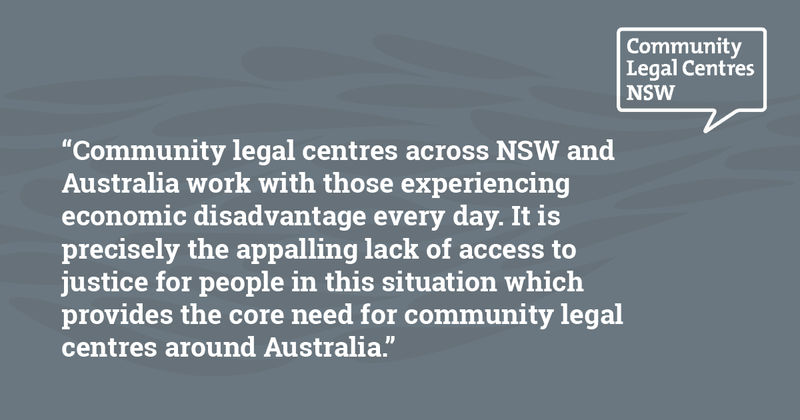 Community legal centres across NSW and Australia work with those experiencing economic disadvantage every day. It is precisely the appalling lack of access to justice for people in this situation which provides the core need for community legal centres around Australia. This submission draws attention to how economic disadvantage is in itself a structural issue presenting barriers to justice for many people in our community. In 2015-16, 20% of the wealthiest Australian households received 40% of total income. By comparison, households in the lowest income quintile received only 8% of total income. This gap is the result of various labour market, education, tax and housing policies which reinforce economic disadvantage while benefiting the wealthiest of Australians. Some of the solutions that Community Legal Centres NSW proposes are as follows. The extension of stable wages and benefits such as penalty rates, overtime and annual leave to all Australian workers, regardless of whether they are casual or permanent. Providing schools with more resources to invest in individual student development, and providing universal early childhood education to work towards breaking the cycle of poverty that entraps children from low socio-economic backgrounds. Focusing on increasing the marginal tax rate for the highest bracket of income earners who earn over $180,001, as well as a new tax bracket for Australians with even higher incomes at a rate of 60%. Limiting or prohibiting negative gearing to both increase the revenue collected by the government and decrease house prices through deflated demand from property investors. A collection of systemic issues ranging from mandatory sentencing and police practices disproportionally impact the lives of Aboriginal and Torres Strait Islander people. These issues severely impact the access to justice for ATSI people. The services that community legal centres provide, such as community legal education programs and the Aboriginal Legal Access Program, are critical in ensuring justice for the ASTI community. The complexity of the legal system lends itself to situations where children and young people may struggle to understand their rights before the law. The National Children and Youth Law Centre works to overcome such barriers for young people especially those in remote, rural and regional areas. Current experiences of discrimination and marginalisation have led to a lack of trust toward the police, the justice system, as well as other social services. Support for the community is an important part of ensuring LGBTQI+ people feel able to access services. The HIV/AIDS legal centre NSW is a specialist centre that provides legal assistance to those who have HIV- or Hepatitis-related legal matters. Older persons in Australia have a disproportionately low level of access to justice when compared to other groups. An increase in the number of cases regarding elder abuse have been identified, and this causes concern for the amount of unreported cases due to this group’s lack of understanding of their legal rights. Rural, regional and remote Australians most notably have to deal with a lack of access to courts and legal advice. Cases are often heard in local Sydney courts, despite the often-considerable distance individuals would have to travel to attend these hearings. The Western New South Wales Community Legal Centre faces a difficult task in providing support services to a very large area and works to ensure everyone in NSW has access to justice. You can access a copy of our full submission here.